who make some of New York's finest stairways. We specialize in the design, manufacture and installation of custom residential and commercial stairs and rails. Our work ranges from traditional to contemporary designs. As part of our offering, we provide free estimates, field measurements and consultation, drafting service, choice of styles and lumber types and most importantly, our experience, knowledge and expertise. We welcome inquiries from all individuals including homeowners, contractors, designers and architects. Metal balusters and wrought iron panels have become a popular choice recently. 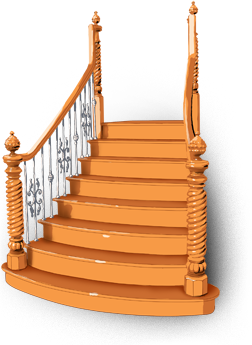 Currently, we source most of our metal balusters from House of Forgings who provide quality and value. To choose your style, you can visit their website here. We work with all the lumber choices. You specify, we provide. Some more popular examples are oak, pine, mahogany, cherry, walnut and maple. © 2012-2018 Stair and Railing Solution Inc. All rights reserved.